We are very lucky to live right at the boundary of town and country, and to share our area with a wide range of wildlife from buzzards to badgers to bumblebees. Over the course of 2014, we put a lot of work into making our area more floral, and more wildlife friendly, inspired in part by the recent BBC “Bees, Butterflies and Blooms” programmes that highlight the importance of urban gardening for pollinators. Community gardening for the bees complete! 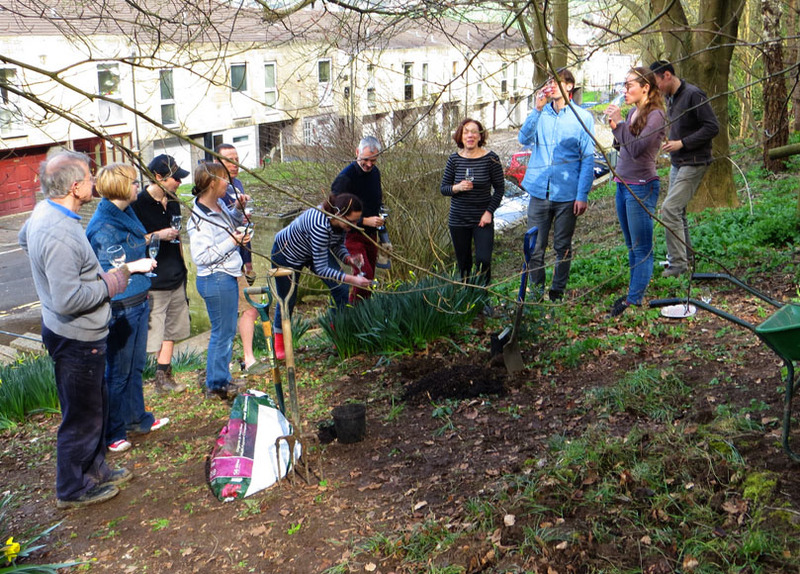 On three consecutive weekends in April 2014 a stalwart group of gardeners met to clear a patch of woodland in Calton Gardens and plant bee-friendly plants and wild flowers. 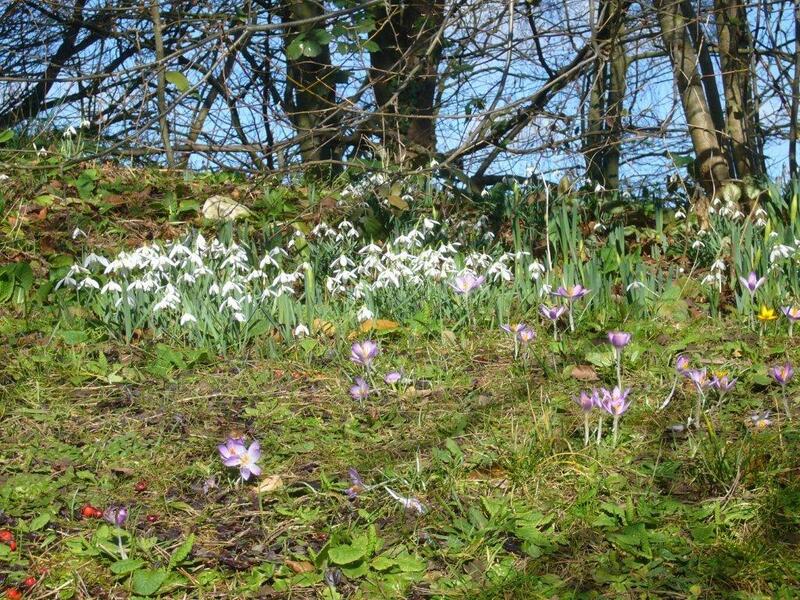 The shady position under the cliff has meant that some plants have struggled, although a spectacular group of snakes-head fritilliaries seems to have established itself, the trees donated by the council are flourishing and there are daffodils. The area certainly looks more welcoming than it did. No, it wasn’t just about standing around with glass in hand – this shot was taken after a good four hours of slogging. Well done everyone! It’s Your Neighbourhood 2015 certificate – Outstanding! 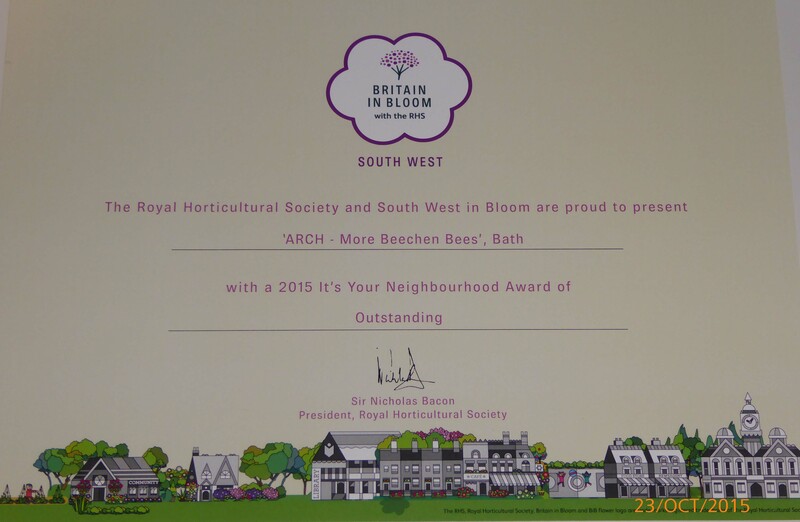 After our community gardening efforts in 2014 were rewarded with a “Thriving” award in the South West In Bloom “It’s Your Neighbourhood” scheme, in 2015 we went one step better and were awarded with “Outstanding” – a result which contributed to Bath’s overall success in the regional and national In Bloom competitions. Work is progressing well in Calton Walk, where we have created a wildlife-friendly space as an example what can be achieved in a small city garden. Our progress can be followed on our dedicated website and blog Ruth’s Garden. We’re always looking for help, and it is highly enjoyable to get out with neighbours and plant flowers, which then emerge in full bloom. So if you see a patch of ground that you think could be more wildlife friendly (wildflowers, bird boxes, hedgehog homes etc.) or if you have any other thoughts on what we could do, please do email us at info@widcombewest.uk.